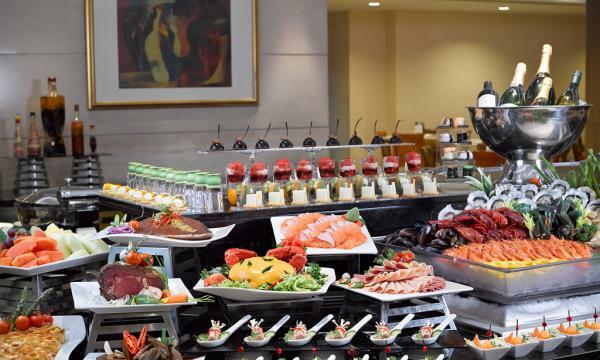 For a limited time only, enjoy 1-for-1 Dinner Buffet at Café Mosaic as it presents a resplendent array of International delicacies. Choose from an assortment of appetisers and seafood on ice such as fresh Oysters and Scallops, delectable mains like Roasted Lamb Leg with Cumin Mustard Sauce, Steamed Fish Fillet topped with Yellow Bean Crust & Sweet Turnip, Braised Pork Belly topped with Crispy Yam and Pan-fried Steak with Beef Jus, or indulge in newly added items such as the Assorted Seafood Pot Pie and Baked Salmon in Puff Pastry. Round up your satisfying meal with our variety of mouthwatering desserts including an assortment of freshly baked pastries, cakes and sweet treats such as Caramel Custard, Cheese Cake and Chocolate Mousse. Enjoy them with a freshly brewed cup of coffee or tea, or enjoy a healthy glass of homemade local beverage including Barley, Herbal Tea or Chrysanthemum Tea at only $3 per glass. Dinner Buffet is available from 6.30pm to 10.30pm. It is also available Sundays to Thursdays $68 per adult, $34 per child and Fridays & Saturdays $88 per adult, $44 per child.